The GNC 420 adds a TSO-certified 760-channel comm transceiver to the GPS 400’s color display, creating the first color GPS/comm in the industry. GNC 420 has all of the IFR GPS and comm features of the GNS 430 minus the VOR, ILS or glideslope capability you may already have in your aircraft. 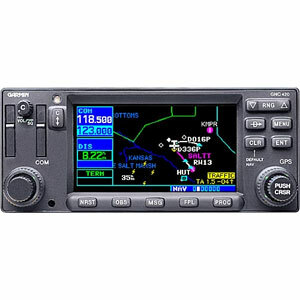 GNC 420 is available with optional WAAS navigational capabilities. The reliable GNC 420 delivers clear communication from its 10-watt, 760-channel VHF transceiver. In the alternative, GNC 420A features a high power 16-watt transmitter for high altitude turbine aircraft. With the 420's frequency nomination feature, you can easily load your next com frequency into standby with the touch of a button. GNC 420's 4-inch high-contrast display with brilliant colors makes it easy to read and interpret pilot-critical information. Effective use of color makes it easy to see your position relative to ground features, chart data, navaids, flight plan routings, approach procedures and more. Conveniently scan information from wide viewing angles, even in direct sunlight. GNC 420 seamlessly integrates built-in terrain and navigation databases, providing a clear, concise picture of where you are and where you’re heading. The 420's huge Jeppesen® database, updated with front-loading data cards, contains location reference for all airports, VORs, NDBs, Intersections, Flight Service Stations, published approaches, SIDs/STARs, Special Use Airspace and geopolitical boundaries. A detailed basemap clearly shows airports, cities, highways, railroads, rivers, lakes, coastlines and more. Using information from the built-in terrain and U.S. obstacles databases, the 420 displays color coding to graphically alert you when proximity conflicts loom ahead. GNC 420 is easy to interface with a wide array of optional sensors and tracking systems, allowing you to see and avoid hazards such as threatening weather, lightning or air traffic. With an optional subscription to XM WX Satellite Weather™ and the addition of the GDL 69 or 69A datalink receiver, you’ll have access to high resolution weather for the U.S., right in the cockpit. Information includes NEXRAD and METARs and can be laid directly over Jeppesen and topographic map databases. With an additional monthly service fee, GDL 69A delivers XM Satellite Radio to your aircraft. Add the Garmin GTX 330 Mode S transponder, and GNC 420 will also display Traffic Information Services (TIS) alerts that identify surrounding air traffic.